Awaken your natural hearing intelligence. Natural hearing means everyday well-being. When hearing, the ears and the brain simultaneously undergo various complex, intelligent processes: For example, they detect acoustic signals, determine the signals’ spatial locations, and evaluate their importance. At HANSATON, we speak of natural hearing intelligence. This refers to the complex interplay of different functions that are so individually and perfectly coordinated that they happen completely unconsciously. But if the ears no longer function properly, then the brain cannot perform its tasks any longer either. That is why we here at HANSATON demand the exact same requirements from a hearing system that a healthy ear would require. 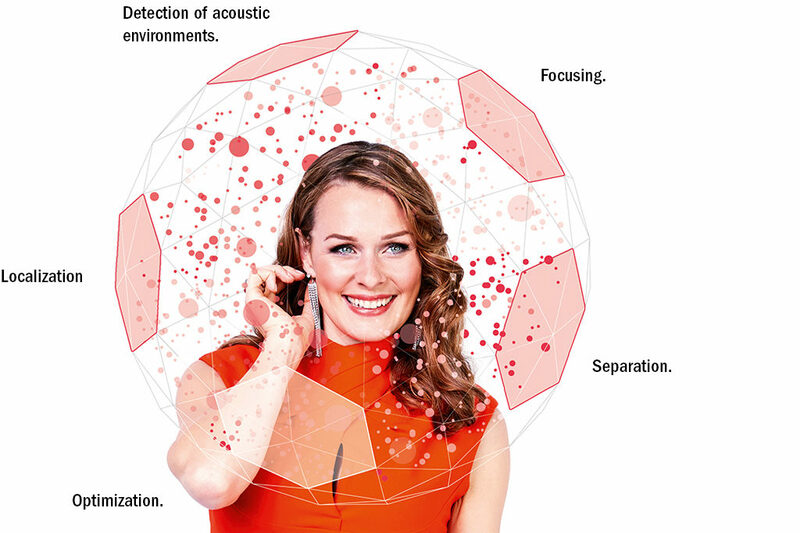 HearIntelligence™ hearing systems from HANSATON have been developed with the aim of taking over the impaired, natural processes of hearing through innovative signal processing. The goal is not only to compensate for the hearing loss, but also to allow for a more natural hearing. With its high-speed detection, optimal signal processing and the innovative feature SphereSound SHD, the innovative SphereHD technology offers a new dimension of spatial hearing and the most natural hearing experience. SphereSound SHD is a core hearing system function, and one of the key components of the chip platform SphereHD. SphereSound SHD makes it possible to localize and spatially perceive sounds and speech, and also to focus in on speech. In three different levels, the hearing system uses SphereSound SHD to imitate the natural functions of the ear that influence sound to localize, bundle and amplify sound. SphereSound SHD means spatial and natural hearing. The outer ear has several different functions within the overall hearing process. For one, it helps localize sources of sound based on differences in how high and low frequencies are influenced. For another, it compresses and amplifies the sound. This sound impression is also influenced by the shapes of the pinna and the concha, and by the shape and size of a person’s head. Using a hearing system means that these natural sound-influencing factors no longer come into play, because of the way the hearing system microphone is positioned above the ear. As a result, sound takes on an artificial quality, and natural directional hearing becomes more difficult. With SphereSound SHD, this factor can be taken into account. Intelligent control of microphone directionality makes it possible to simulate natural sound reception, in other words to recreate how the ear and head influence sound. Influencing effects caused by the position of the hearing system are eliminated. Spatial, natural hearing is the result. This makes it possible to localize the sources of sound again. AutoSurround SHD. The natural situation mix. The automation function of natural hearing intelligence refers to acoustic versatility whereby the ear receives, passes on to the brain as information and can produce correspondingly appropriate reactions. Thus no acoustic situation is the same as another. Our acoustic environment not only consists of speech, sounds or noises. It is composed of many of these individual components. There is no single standard situation. Instead, there is a mixture of the individual components, which reflects the actual acoustic situation. Since acoustic situations can change abruptly, the natural hearing intelligence reacts automatically to these changes and for humans, completely unnoticeably. The precise input supplied by SurroundSupervisor SHD is the key to ideal hearing system adjustment: the AutoSurround SHD program automatically adapts hearing system settings to fit the current environment. Here’s the best part: Rather than simply using fixed programs, AutoSurround SHD can recreate a practically infinite variety of acoustic situations. For the ultimate in music enjoyment: If SurroundSupervisor SHD detects that a majority of the sound input is music, AutoSurround SHD will gently shift hearing system settings to the parameters defined for music. SurroundSupervisor SHD acts as an interface between the hearing system and its surroundings while replicating its acoustic environment realistically. Speed and precision are the keys to its success, since the hearing system’s signal processor can only fully realize its abilities to restore natural hearing if it knows the acoustic environment exactly. By optimizing our algorithms and storage capacity management, we have made our environmental detection program significantly faster, and greatly improved the precision of our speech detection module. The powerful, highly sensitive SurroundSupervisor SHD is able to analyze the acoustic environment precisely and map it quickly. In fact, it does this about 700 times per second, with the help of more than 30 high-resolution sensors. Intelligent signal processing ensures natural hearing practically in real time. Speech clarity in any situation with SpeechBeam SHD. In the hearing system wearer’s personal acoustic environment, the direction of speech changes relative to the wearer. SphereHD hearing systems use the SpeechBeam SHD function to focus in on whoever is speaking. SpeechBeam SHD generates a variety of microphone orientation characteristics to determine the exact direction speech is coming from, 360° around the hearing system user. Unlock new frequencies with scout. Because initial sound impressions count. HANSATON developed its scout fitting software and its BalanceFit fitting strategy to ensure immediate customer satisfaction during the fitting process. Together, they offer both audiologists and their customers flexibility and freedom while overcoming numerous auditory and procedural hurdles. Scout allows precise adjustments to any personal or audiological parameters relevant to an individual hearing system wearer, and distinguishes itself through its logical, thematically oriented structure. That means quick and easy access to the different features during the fitting process, and thus efficient programming. 50 %. So you have more time for one-to-one advice. The details are what makes scout truly shine. When developing scout, HANSATON placed special importance on giving audiologists detailed access to the available parameters, thus ensuring them maximum freedom of action. Fulfilling modern design requirements was another priority, in order to give users a pleasant working experience—right down to the smallest detail. After all, the software is more than just means to an end. It is one of the most important tools of the audiologist’s trade. Intuitive and effective with PersonalTuning. Personal Tuning makes the fitting process faster, more efficient, and more personalized than ever before. You’ll reach your goals in just a few clicks, while still responding to your customer’s individual needs. The Personal Tuning user interface bundles access options for key parameters, giving you the most efficient support during the fitting process. It saves you a lot of tiresome searching and clicking around by optimizing pathways and minimizing the number of clicks necessary. All relevant parameters can be specified in all three areas (amplification, sound, and acclimatization) without negatively affecting quality. The advantage: Achieve high-quality fitting more quickly, leaving you more time to talk to your customers.